Raw garlic? Eww! Black garlic? Yay! No, really! Black garlic is the new black. Let me tell you why. Imagine garlic without all the annoying stuffs. No bad breath. No pungent odour. Just a jelly-like compound of caramelly sweetness and savoury mild garlic undertones. 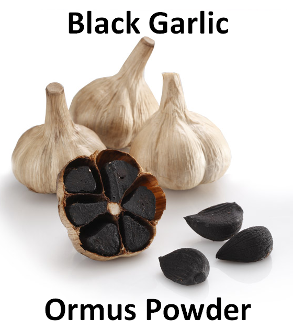 Even better, black garlic is loaded with nearly ten times as many polyphenols, which are powerful cancer-fighting compounds, and two times as many anti-oxidants, than raw garlic. It is great for your health and the health of your elderly loved ones! In Taoism mythology, black garlic was rumored to grant immortality. I can’t promise you that, but there’s no doubt that black garlic is great for your health—it’s loaded with nearly twice as many antioxidants as raw garlic. It also contains S-Allycysteine, which is fancy talk for a natural compound that has been proven to be a factor in cancer prevention. 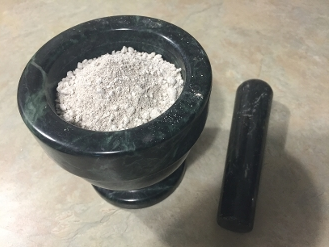 I took whole black garlic cloves and ground them up in a blender with aetherically charged negative ion water. I then took that substance and added Organic Dolomite Lime and preformed the John Hudson method. After 7 washes and drying it out it, it turned into a white powder that can be consumed without the extreme taste or smell of consuming garlic but all the benefits magnified and concentrated with Ormus minerals.